Welcome to the first installment of Our Italian Vacation. Obviously, the food there was a high point of our vacation. I ate pizza every day for lunch (except the one day I just ate a ton of almonds) and pasta every night for dinner. Basically a dream come true. I have a lot to tell you about, but I wanted to start with this pasta cooking experience, as this is a food blog and you probably care more about what we ate than how I killed a bat in Venice. So, we went to a cooking class in Florence to learn how to make real live, home-grown, legit Italian pasta. 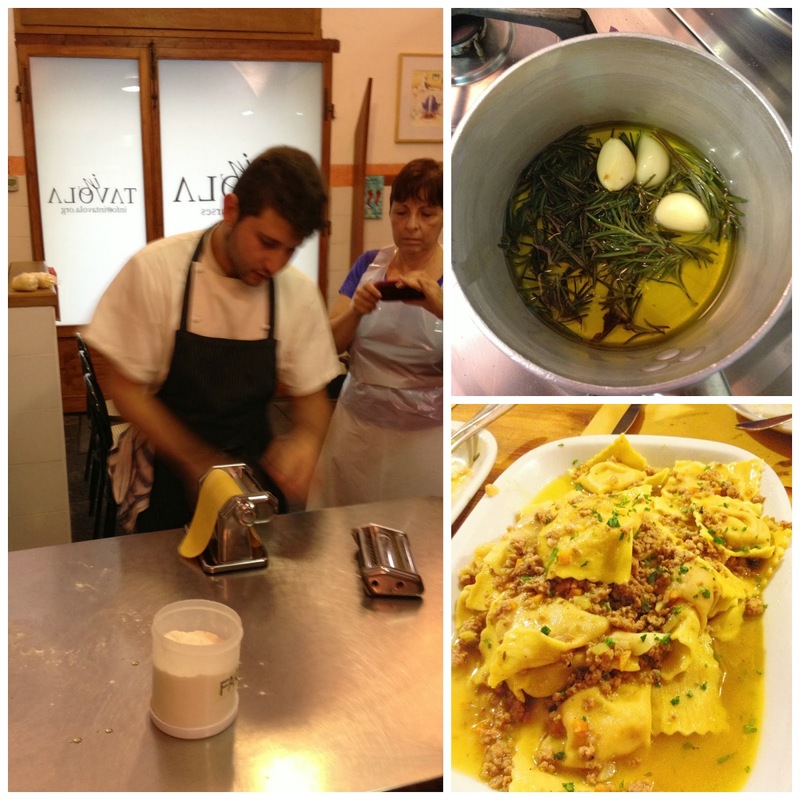 (If you're ever in Florence - I highly recommend their cooking courses.) Let me preface this with the fact that Mike and I have made pasta numerous times before, but I never felt like we were doing it quite right. It never melted in your mouth, or slurped the right way, or didn't stick together, or didn't fall apart during boiling. But this pasta.... THIS PASTA IS PERFECT. 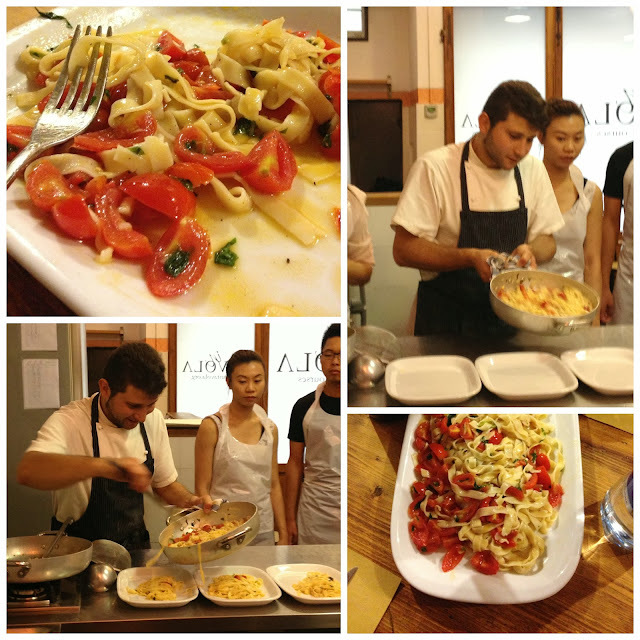 We made two types of pasta during our cooking class, and three different dishes. The recipe I'm sharing below was our favorite. The raw tomato sauce is so light and refreshing that you won't feel like you just ate a giant bowl of pasta (but of course you did just eat a GIANT bowl of pasta). This sauce is also extremely easy and fast to make. I'll try to share the rest of the recipes on later blog posts, but please feel free to email me if you would like them sooner. We had this cute little Italian cooking instructor (see above) who taught us a bunch of little tricks. He called me Elizabéta and Mike was Michéla, and he'd put an accent in the middle, like any good Italian would do. You know what I mean. Mike was charged with peeling the already cooked potatoes and squeezing them through a potato ricer for the ravioli filling. 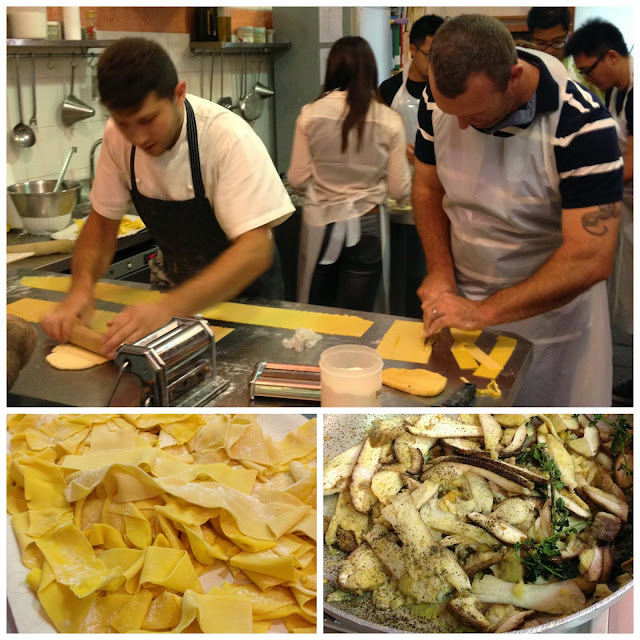 The instructor took one look at Mike, who looks stronger and larger than most Italians, and said, "Michéla - squeeze this (and slammed the potato down on the table in front of Mike), through this (and handed Mike a little hand-held potato ricer)." 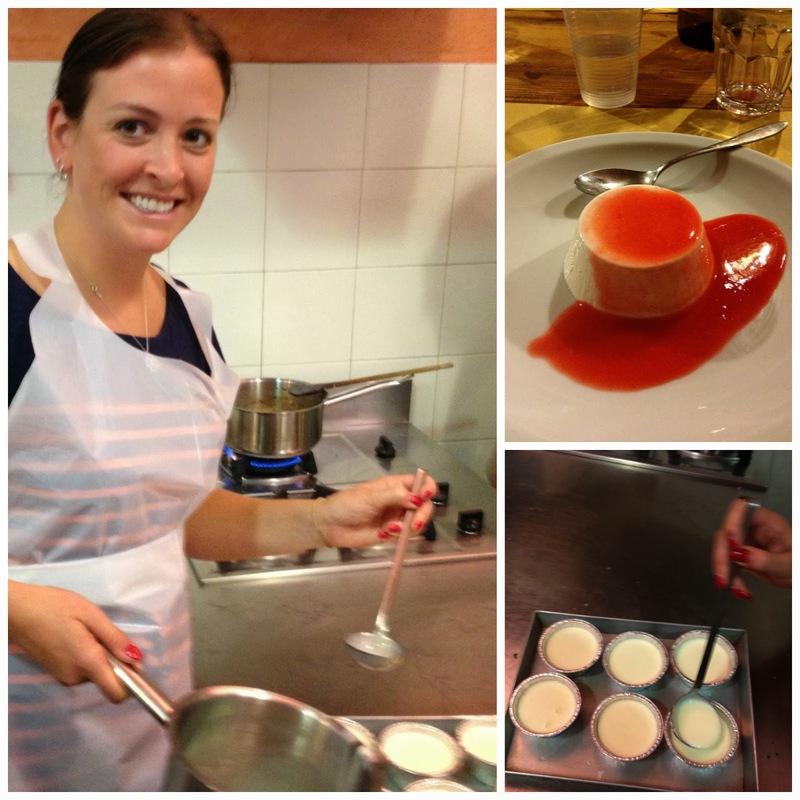 The instructor then showed me how to make the dessert - a glorious panna cotta. I was a panna cotta virgin and was, let's say, squealing with excitement at the chance to be taught how to make this dessert by an Italian chef. When I was done, the other couple at our cooking station jokingly asked our instructor why I got that job and Mike got the potato-squeezing job. The instructor said with a huge smile on his face, "Michéla has big muscles (but he said it like mooscles) and is good for squeezing potatoes. Elizabéta is good at making desserts. I know what I'm doing!" Then he winked at us. Then we proceeded to roll out the pasta dough with a hand-roller. The Italian instructors would encourage us in Italian, saying things like, "Dúe!" (Doo-ay) when we were supposed to roll the dough out on the #2 setting. And "Béne!" (ben-ay) when we did something right. Those are my two favorite Italian words, because they'd say them over and over again with such enthusiasm, and throw their hands up in the air to emphasize what they were saying. Freaking adorable. I got to roll out the dough for our group. "Elizabéta - perfécto!!" Let's just say... this girl was on cloud 9! Mike was also thoroughly impressed with himself the rest of the day because the Italians thought he had big mooscles. Kneading the dough. I always just did this in my Kitchen Aid mixer with the dough hook. No! Knead it by hand after you mix the dough together until it's really smooth and pliable. At least 5 minutes of good, intense kneading. The trick to kneading is to roll out your dough in a long strip, like your'e playing with Play-dough, and then to fold it over the long way and push on it with a lot of force with the heel of your hand. Repeat until your dough is really smooth and elastic. Use plenty of flour. I never used enough flour. Rub each side of the pasta sheets with flour before your run them through the roller the final 2 - 3 times. This way everything will stay separated, and if you choose to cut the noodles into fettuccine or spaghetti, the noodles will not stick together. Toss the noodles with more flour after you cut them to help even more. When making ravioli, we used a pasta cutter and a metal spatula to help keep the ravioli from sticking to the counter-top. Brush just a tiny bit of water in between each mound of filling before you form the ravioli to help seal them together so they don't open up during cooking. Squeeze all of the air bubbles out of the raviolis before you cut them. If you aren't cooking the ravioli right away, place them on a wax or parchment paper lined cookie sheet, but DON'T stack them on top of each other or they will stick together. This recipe calls for durham wheat flour and 00 flour. We can't find either where we live, so we have used all-purpose flour to make this recipe twice since we've returned from Italy, and the pasta tastes just as good to me! Weigh the flour out into a large bowl and make a large well in the middle of the flour. Crack the eggs into the well and beat the eggs with a fork. Salt well then slowly begin incorporating the flour from the inside perimeter of the well into the mixture with a fork. When combined, dump the mixture onto a clean counter-top or large cutting board and knead the dough until smooth and elastic. Gather the dough into a ball, wrap tightly in plastic wrap and let rest for at least 30 minutes before using. To roll out using a machine: Cut the ball of dough into 2 equal parts. Working with one half at a time, use your hands to form the dough into a long sheet so that it will fit through the roller. Roll it through on the largest setting (1 on my Kitchen Aid, but 6 on the hand-roller we used at class). Slightly flour, fold the dough on top of itself a number of times and roll with rolling pin until the width is the same as the pasta roller. Run the dough through the machine again at the widest setting, then decrease the setting by two, run it through again, and then run it through twice at the next to skinniest setting (5 on my Kitchen Aid but 2 or "DUE" on the hand-roller we used in class), folding and repeating until the pasta is the desired consistency. For ravioli, finish on the skinniest setting, for other cuts finish at desired thickness. 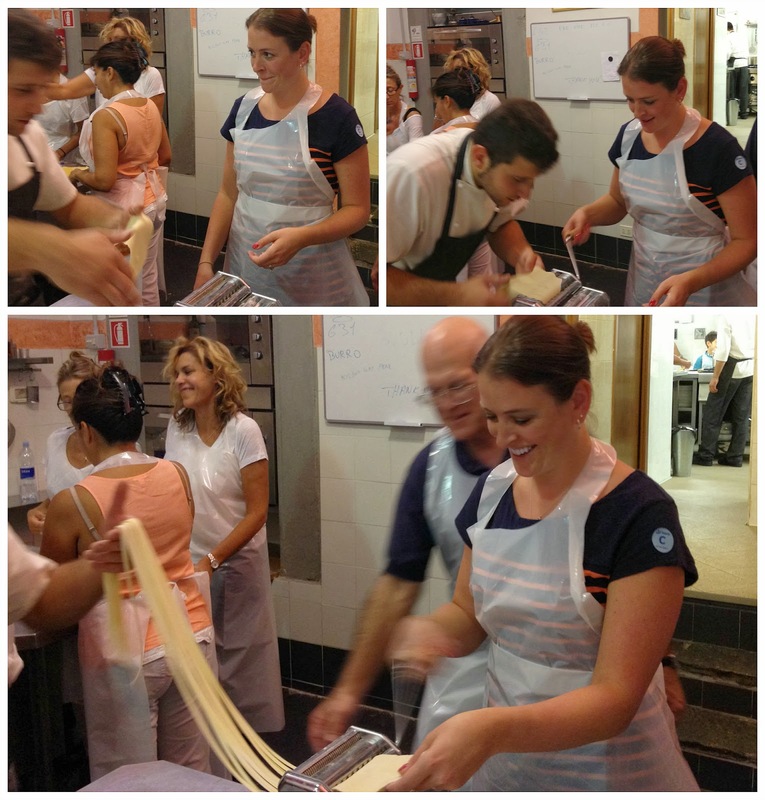 Hand cut into 1" wide strips to make papardelle or use a pasta cutting attachment to make fettuccine or spaghetti. If you use a pasta cutting attachment, make sure to dust the pasta sheets with extra flour before running them through the cutting machine. Toss with more flour after cutting to ensure the noodles don't stick together. Boil in salted water for about 2 minutes and drain. 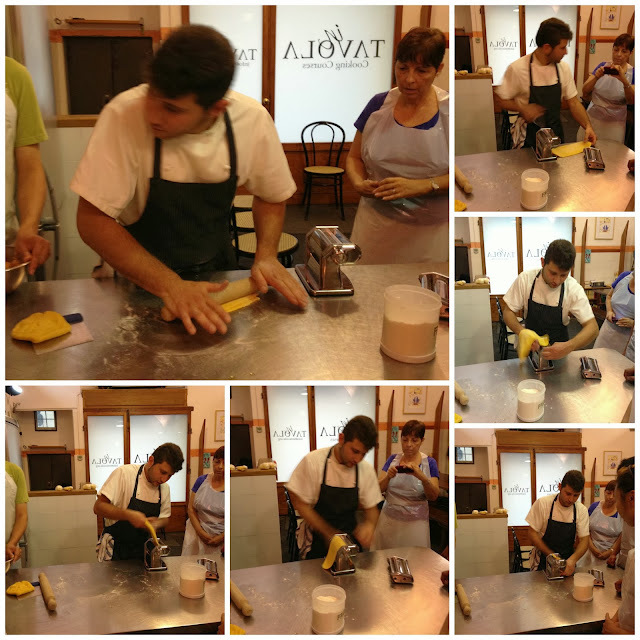 Hello Elizabeth, I enjoyed your post on your pasta making class in Italy especially because Jennie and John are my relatives, she sent me the link to this post. What a great experience along with fabulous food! Hi! I'm so happy to connect with you! Jennie told me about your blog as well, and I just liked your FB page and can't wait to see all of your recipes!